Sony has announced a new interchangeable lens add-on for smartphones at IFA 2014. Sony has announced the new Sony ILCE-QX1 at IFA 2014 - the camera is an add-on for smartphones that features the Sony E lens mount, and will accept Sony NEX / E-Mount lenses. The QX1 features a 20 megapixel APS-C CMOS sensor, a built in flash, RAW shooting, and built in Wi-Fi and NFC. 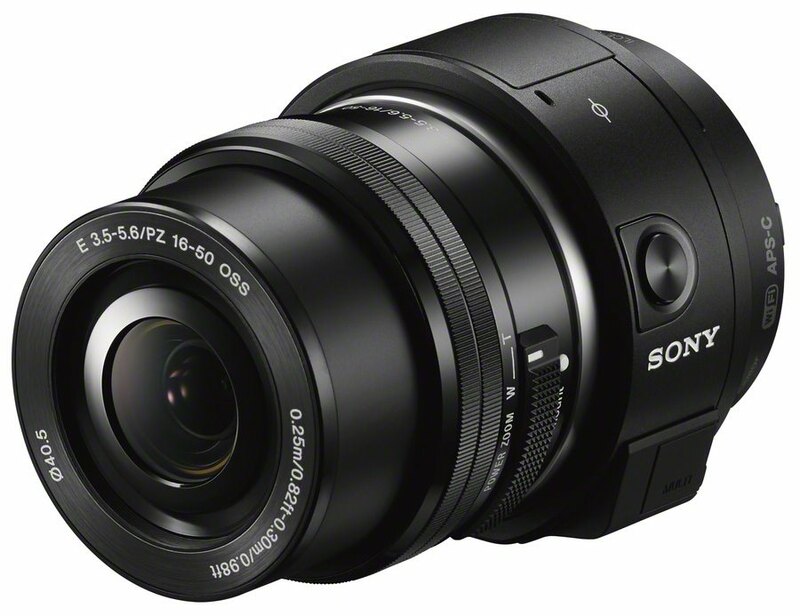 The Sony QX1 will be priced at £249 and will be available in October. From Sony: Sony is expanding its Lens-style Camera lineup with two new models that link with smartphones*1 via Wi-Fi, and can be directly attached to smartphones or used separately to allow users to take pictures of themselves, or other high-quality photos and video*2 from any angle. ILCE-QX1 features the same APS-C CMOS image sensor as Sony's mirrorless interchangeable-lens cameras, and is capable of taking high-quality photos with beautiful defocusing and clear night scene shots with high sensitivity and low noise, as well as a wide variety of expressions through its compatibility with interchangeable E-mount lenses based on the α™ Mount System. The ILCE-QX1 lets serious photographers make use of their precious E-mount lens collection. Just pick your favourite lens – zoom, wide angle, tele or macro – and unleash your artistry with control over exposure, focus and shooting modes. The lens-style camera’s APS-C size Exmor CMOS sensor with 20.1-megapixels captures flawless detail, just like you’d expect from a much bigger camera. Teamed with Sony’s advanced BIONZ X processor that now features improved area-specific noise reduction, you’ll really notice the difference with stunning low-noise images - even if you’re shooting in near-darkness when small sensors struggle. The large sensor inside the QX1 also lets you create pro-style ‘bokeh’ effects with smooth background blur – a trick that smartphones can’t match. Serious snappers and casual photographers alike will be spoilt with a wealth of other premium features. Superior Auto recognises different scenes from landscapes to backlit portraits – adjusting settings for top-quality results without fuss. For those photographers who enjoy post-production editing, the QX1 can now shoot RAW image files and in a lens-style camera first, the QX1 debuts a pop-up flash to brighten up portraits, gloomy interiors and night scenes. The LCS-QXA Case and Strap Kit adds a touch of luxury with its tough brown leather-look finish. The QX1 is protected snuggly, with a choice of shoulder strap or belt-mounting options while you’re out and about. DSC-QX30 features the same 30x optical zoom Sony G Lens, Optical Steadyshot and auto-focus functions found in Sony's Cyber-shot™ models, making it possible to capture photographs that could not be taken using just an internal smartphone camera, such as distant subjects, with less blur. Updates to Sony's mobile application PlayMemories Mobile™ have improved connection time and stability after connection, while also enhancing functionality and the user interface for easier operation. *1: Smartphone and tablet compatible with "Play Memories Mobile" is required.